Shares jump in response to two bullish analyst notes. Here's what investors need to know. In response to favorable coverage from Wall Street, shares of Natera (NASDAQ:NTRA), a diagnostics company focused on noninvasive genetic testing, rose 18% as of 4 p.m. EDT on Monday. Natera's bulls can thank Morgan Stanley (NYSE:MS) and Canaccord Genuity for today's price action. 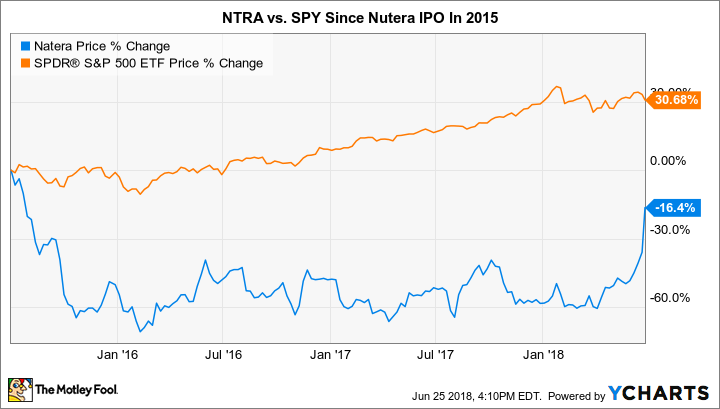 Morgan Stanley published a bullish research note to investors on Monday that featured a price target increase on Natera's stock from $16 to $20. For perspective, Natera ended Friday's trading session at $16.07. It was a similar situation at Canaccord. The brokerage company bumped its price target from $19 to $20 in a report to its clients. Wall Street cheered the vote of confidence by sending the share price higher. Natera's stock has now more than doubled since the start of the year. While that's been positive for investors, this stock has still underperformed the market since its IPO in 2015. The decline is largely attributable to lower average selling prices on its noninvasive genetic test as it transitions to in-network contracts with insurers. However, that headwind looks like it is starting to become less of an issue. Last quarter, the company reported an increase in gross profit thanks to the launch of its third-generation Panorama test. If Natera can continue to push its testing volume and gross margin in the right direction, then this bullish move might be able to continue. However, since the company is still losing money and carries more debt than cash on its balance sheet, my plan is to root for this company's success from the safety of the sidelines.